Did you know that chia seeds have more antioxidants than blueberries? The lady at the health food store told me this...I googled it and she was right! Pretty impressive. They are also known to increase energy and help ward off hunger. Love that. 2 cups of almond milk. If you want to make your pudding sweeter you can use vanilla almond milk. 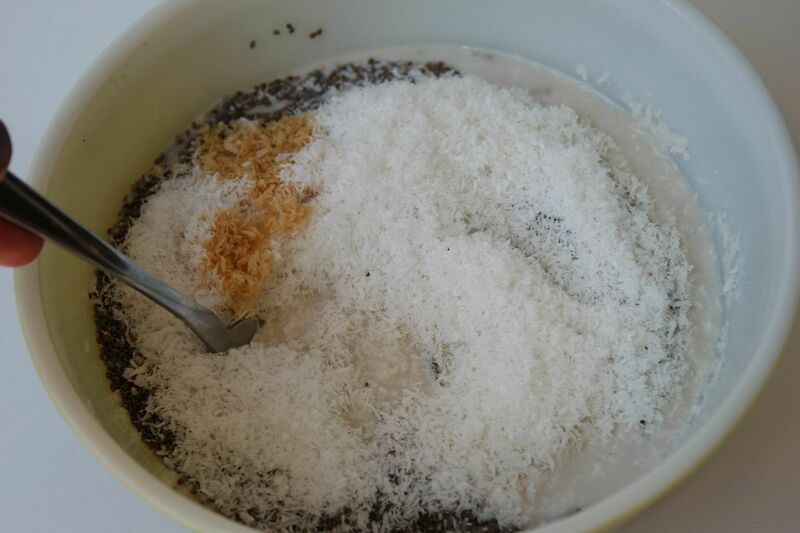 1/2 cup of unsweetened finely shredded organic coconut. If you want to make it sweeter use sweetened coconut. 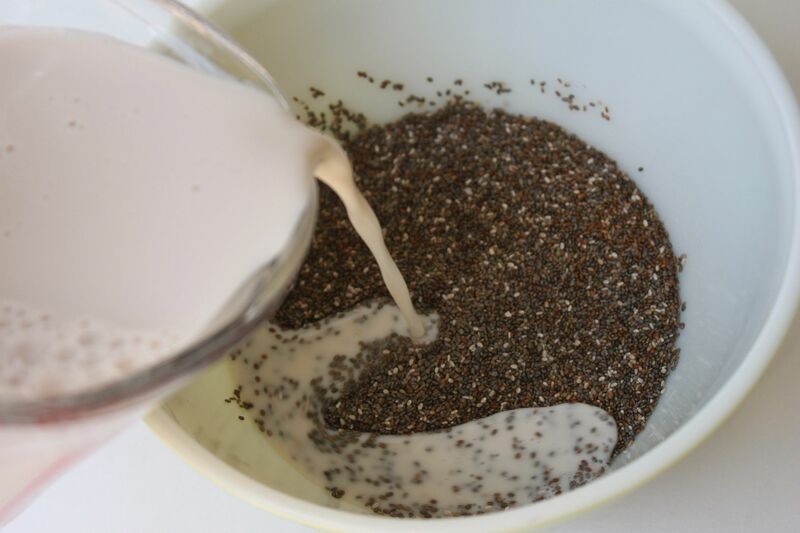 Pour the chia seeds in a mixing bowl and add all of the ingredients. Mix everything together. You will begin to notice the chia seeds taking on a more jelly like texture. Wait five minutes or so and mix again until you have a pudding like consistency. That is it! Your done. Simplest recipe ever. You can either enjoy it room temperature ( I prefer it this way) or let it chill in the fridge. This is by far the easiest and healthiest little treat that I have ever made. It was light, not too sweet and the prefect after dinner treat! So what did the husband think?...When he hesitantly took his first bite he looked at me and said, "Hmmmm NOT bad." He ended up eating a whole little bowl of it and even had a suggestion for next time (yeay a next time). He suggested I add pureed strawberries or blueberries. Great idea as a matter of fact. I love that this stuff helps ward off hunger and has so many antioxidants! I'm not gonna lie it looks a little chunky/gritty - does it have a weird texture? I always love it when I try out a new recipe and there is a next time! Honestly, it looks a little strange, but I would totally give it a try! Especially if it wards off hunger! Congrats to the winners! :) And how awesome is that pudding?! That's amazing! More energy is always welcome! I will have to try that. Hmmm. I have never tried this. Makes me want too! I'm going to have to try this. You have a brave husband. I'm not sure mine will try this. Fingers crossed. Shut the front door! I won something?! ME???? I am so totally peeing myself right now. And it has nothing to do with the fact that I'm pregnant. Oh yeah, I would have had the same reaction as the hubs. Chia pudding? Really? But it actually sounds pretty good - especially with the fresh fruit. Sherri- When you put them into liquid they puff up and have a softer texture..with just a tiny bit of crunch. They are also really yummy plain or sprinkled on top of salads! If it wards off hunger, I am in. :) Thanks for sharing friend! I've never heard of this until now, thanks for sharing yet another great health food, it looks very healthy and if your husband says it's good, it has to be good. I already bookmarked this under my recipe folder. Chia seeds...who'd have thought? I'm a firm believer in giving it a try before making up my mind. I can't say that I've ever brought home chia seeds. I'll have to look into it. If you won a mans heart with this kind of recipe then I'm sure it's awesome. I'll have to try it. Sold! I'll pick some chia seeds the next time I hit Whole Foods. I have been looking for a healthy (semi) sugar free treat recipe everywhere! This looks yum! Off to find some chia seeds now! Congrats winners! I have never heard of Chia Seeds! Are they what were grown in the Cha-Cha-Cha-Chia Pets? Ooo what a fun idea! I will definitely have to try this! Yum! Oh goodness I love that, I've never tried it that way before but what a great idea! Thanks! heehee! I love that you're winning your husband over. They had a chia seed pudding for sampling at Whole Foods. I practically died, it was so good. I wished I had the recipe. Now I do! I can't wait to have my own kitchen soon, and grocery money. I'm gonna comb through your blog and make all the yumminess! Hmm...I have to admit, I tried to like chia seeds, but just couldn't. I might have to give your recipe a try. Oh, but I'm a little skeptical! Oooh yum...and such a super easy recipe! What a fun idea! It looks a little strange, but I would totally give it a try! Hi! Thanks for passing by my blog. The pudding looks delicious! darn, wish I had seen this giveaway earlier! 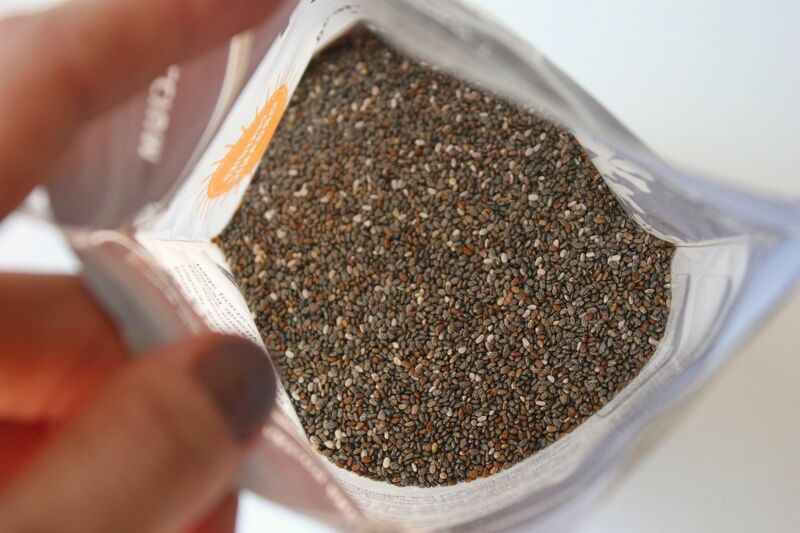 I have been reading about chia seeds and would love to try them! I've never had chia seeds before, but I'm trying to incorporate more healthy, whole foods into my diet so I'm curious to try this. I love coconut! I've been making these great veggie smoothies lately - this morning had kale, zucchini, banana, berries, orange juice, plain nonfat yogurt, raw honey, nutritional yeast, and soy protein powder. It doesn't sound too appetizing for most, but I love starting off my day with something so great for my body. Anyway, when I make these they often remind me of your blog and all the great tips I've picked up here :) I know blogging can be time consuming, but thanks for all you post!!! I like your quick, healthy recipes here...perfect for busy mums! I use chia in my bread but haven't tried it using it for anything else. I'try this soon. Ian is a Pretty good trooper...Most guys wouldn't even try it....Uncle Paul would just laugh at me and say "no thanks,you eat it..."
Nice recipe! 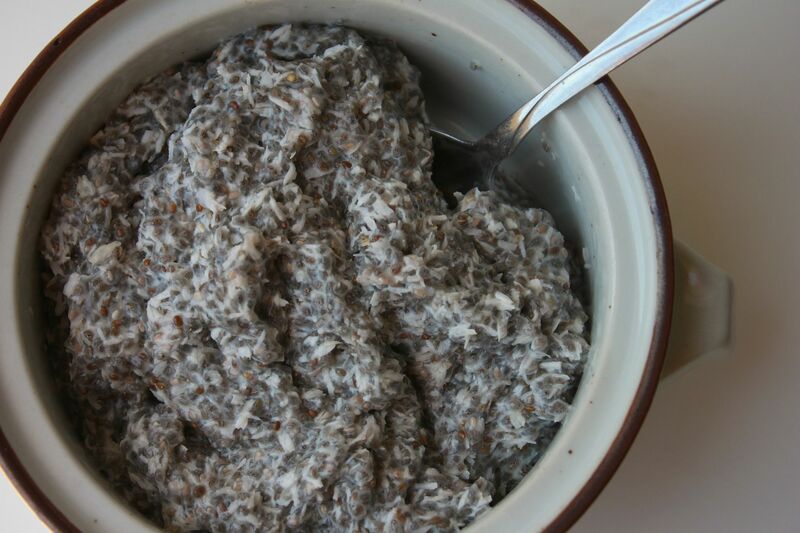 I'm a big fan of chia seeds, great way to get fiber without all the extra texture feel! Oh what a cool idea!!! I've never heard of Chia Seeds! Sounds yummy though! So glad chia seeds are getting the attention they deserve! :) I've used them since I started marathoning and they are AH-MAZING at helping you retain hydration. Would it work eith vsnilla soy milk? Or would that just be gross? Loooove your blog btw!!! I love your blog! I've made a couple of recipes from it and my boyfriend's tried them. He always loves them, but half way through eating he'll stop and have the most offended expression and say "Hey, wait. This is heeaallthy isn't it!" He thinks I'm trying to trick him into eating healthy... Your recipes sure help! just made this with a few drops of liquid stevia and crushed pecans on top, SO GOOD! I do have a question though, how many servings is this recipe? I found it too much for one, I could probably section it off in to 3-4 servings myself.